Bissell’s “bladder” water tank system. The inner bladder is being filled with clean water. Screengrab from video demo below. 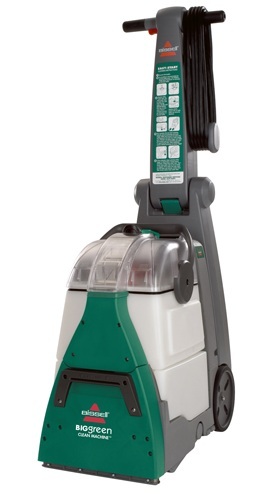 Most of Bissell’s regular upright home carpet cleaners come with a one-tank “bladder” system that has been advertised as offering convenience to users. As a user, you will only need to carry one tank with an inner bladder pouch to the sink to empty and refill it. Although this could be helpful, it also creates other inconveniences. A lot of users have remarked that the inner bladder tank set-up makes the emptying of dirty water awkward. 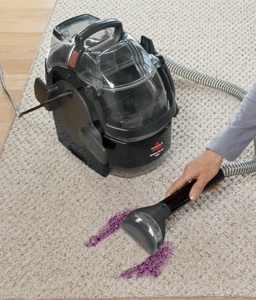 In comparison, Hoover offers a two-tank system for its regular upright carpet cleaners for home users. In general, there are less grouses concerning a dual water tank system, as it appears to be simpler to understand and apply. One tank is for holding the clean water and detergent mix. A second dirty water tank collects the dirty water that is suctioned from the carpet during the cleaning process. This difference in tank systems between the two respected companies has been highlighted in the Hoover vs Bissell Carpet Cleaning Machines Compared post. It also includes numerous other points of comparison between the two brands. What Is The Bladder Water Tank System? Bissell’s single water tank system consist of a water tank with a “bladder bag” inside. The bladder bag is just a water pouch made of tough material to hold clean water with detergent for carpet cleaning purposes. Think of this as an “inner tank within a tank” system. As the clean water from the tank bladder is used up, it gets suctioned back as waste water into the water tank. Most Bissell carpet machine users seem at ease with handling this one-tank bladder pouch system, but there are some complaints about it. This is even from home users who like their Bissell cleaners, but wish the tank system was simpler (eg. “a two-tank system would be nice”). For Bissell fans, the company has introduced a new consumer upright carpet cleaner design that incorporates a two-tank system. Check out the Bissell ProHeat 2X Revolution 1548. 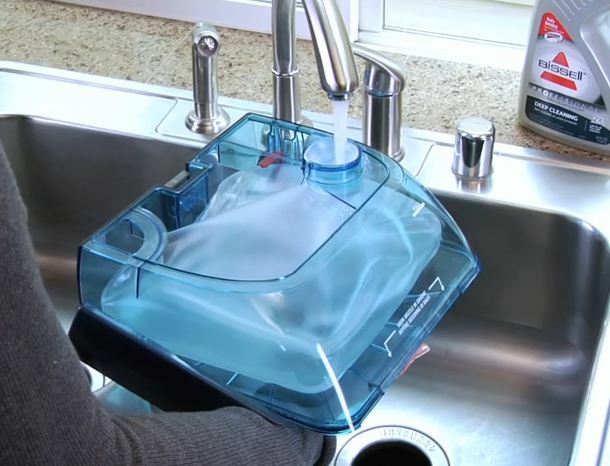 As Bissell advertises, the main advantage of the single-tank bladder system is that it allows users to carry only one tank to and from the sink when emptying and refilling. This benefit seems to elude most users. Almost no one talks about this being a great benefit. In fact, with dual-tank systems, hardly anyone complains about having to bring two separate tanks to the sink – one for refilling and one for emptying to the sink. Sometimes, the tank is filled with waste water and you will then need to carry BOTH clean and dirty water to the sink or bathroom. With a two-tank system, you would only need to carry the dirty water tank to the sink or toilet and empty it. It can be difficult to empty out the dirty water completely while there is still clean water and detergent mix in the clean water. Although you are supposed to pour out the waste water from the far end of the tank, you may sometimes have to shake off the dirt/hair/debris inside the tank. This shaking and maneuvering causes the clean water with detergent to escape. Some models have tank caps that help to keep the clean water and detergent mix in, but clean water may still leak if you are shaking the tank a lot (such as when removing the pet hair or other debris). This is less of an issue if the Bissell carpet cleaner model you are using has a separate detergent mix tank, or if you are not using any detergent. In those cases, you may lose some clean water in the process, which is less painful than losing both water and detergent. In any case, a single bladder tank set-up is just not as straight-forward when compared to a two-tank system, where the user simply needs to just dump out a tank of waste water. A more minor point of dissatisfaction with having a bladder tank system for some users is that it is difficult to tell if the clean water tank is emptying out. Some users prefer a system where this information is clear to them. Two-tank systems may score better in this regard. A lot of times, the tanks are made of translucent plastic material and strategically placed, so that users can see the water level. Based on user feedback, it appears that the one-tank bladder pouch system is less well-liked than a two-tank system, principally because it is somewhat awkward to handle. At the same time, there are many who say they are not bothered by it. Some users feel that they do not really enjoy it, but it is more of a manageable annoyance than a deal breaker. 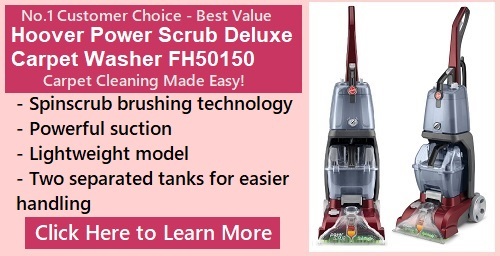 Hoover regular upright cleaners do have a slight design edge by offering a two-tank system. Nevertheless, Bissell machines that use the bladder tank system continue to be very well-rated and liked overall. Other factors also matter when it comes to choosing a carpet cleaner, and more can be found in this Hoover vs Bissell comparison. Looking for a regular home carpet cleaner but not sure what to look for? Check out the Carpet Cleaning Machine Buyer’s Guide. I have the 2014 “yellow” 2x version which has the 2-in-1 bladder tank. Of couse you have to be careful, as the waste-water bag is soft. Well-made, so, used under home conditions, should last a long time with proper care. Tank replaceable for $50 from Bissell. If your carpets haven’t been cleaned in a while, expect a lot more pet hair and black dirt the first time out. Vaccuming first helps but this machine pulls out a lot of imbeded dirt. Relatively easy to clean but the pet hair may get caught in the machine the first time and require rotating-brush cleaning at first. My white carpeting (it’s a used house-I hate white) is the whitest in 4 years. Cleans as well as a much heavier rental machine or “Stanley Steamer” man. It should last enough years to easily pay for inself. Almost 100% plastic, so not for people who are “rough handlers” of floor cleaners and vaccums.